Malta’s location at the midpoint of the Mediterranean has made the island a centre of trade and tourism. Welcoming almost 2.5 million international tourists last year with the number of visitors growing by almost 10% annually, Malta’s hospitality industry employs 30% of the country’s workforce and is anticipated to grow to 40% of the island’s employment over the coming decade. 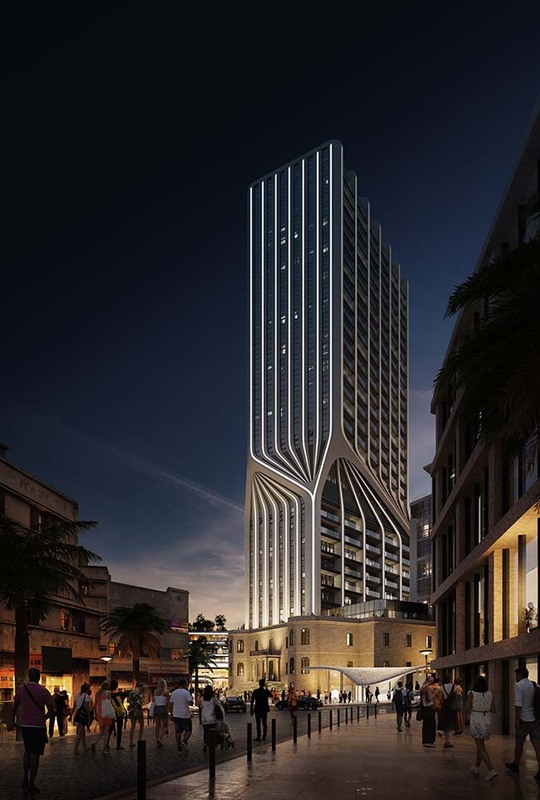 From the architect: Located on Malta's East coast, Paceville has developed over the past 50 years as the island’s tourist and entertainment centre, accommodating new projects that address this continued growth. Established as a cluster of holiday homes in the early 20th Century and developed into a major tourist hub from the 1960’s, Paceville is at the heart of St Julian’s in Malta where many of the island’s restaurants, bars, nightclubs, casinos and marina are located, together with international hotels including the Hilton, Le Meridien, InterContinental and Westin. 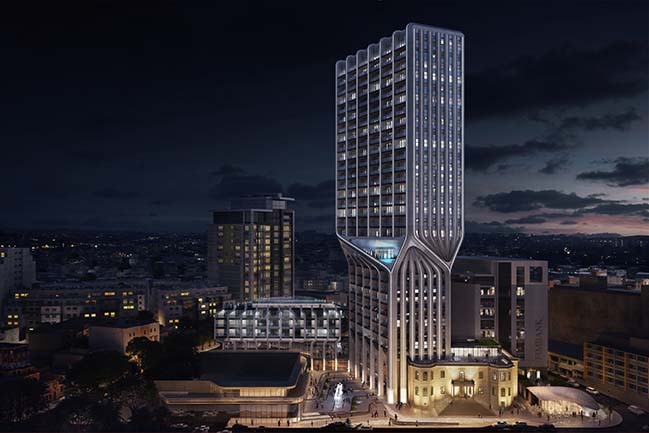 The renovation and redevelopment of Mercury House integrates residential apartments and boutique hotel within Malta’s most dynamic urban environment. 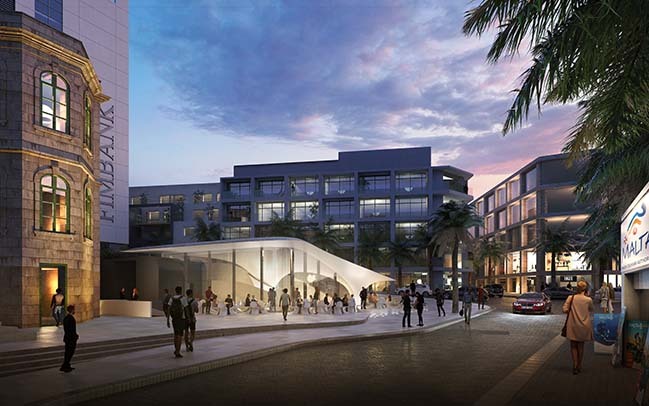 Creating new public spaces and amenities for the island’s residents and visitors, the design responds to Paceville’s key urban challenges by investing in its civic realm and increasing its limited housing supply. Derelict for more than twenty years, the 9,405 sq.m. site includes the remaining façades of the old Mercury House that date from 1903. Two underground vaults created during the Cold War are also within the site’s boundary. Working with Malta’s leading conservation architect, these heritage structures will be renovated as integral parts of the new development; restoring the old Mercury House façades and reinstating its remaining historic interiors as gathering spaces and entrance for the apartments and hotel. Restoring the facades of the old Mercury House to their original height enables this heritage structure to be read as a whole. The new development lands behind these renovated façades, defining the original Mercury House as the focus of a new public piazza. 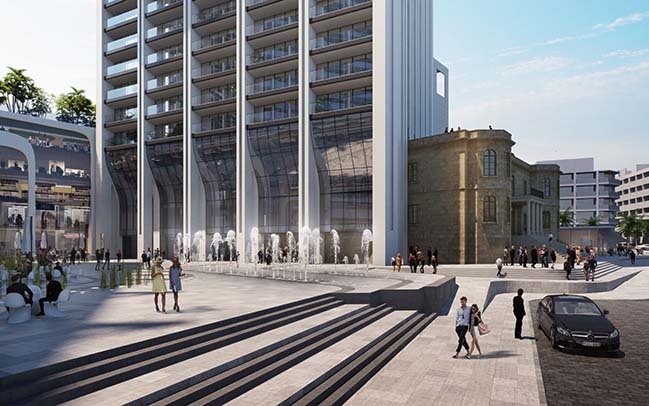 Including water features and fountains for children to play, as well as seating areas to relax, the new piazza will be the centre of its community by day, and one of Malta’s primary gathering places by night to suit the island’s al fresco lifestyle. With the refurbished Mercury House at its base, the 24,500 sq.m. renovation and redevelopment incorporates civic amenities including cafes and shops surrounding the large piazza together with a new café pavilion of soft curves and a transparency that accentuates the solidity of the old Mercury House. 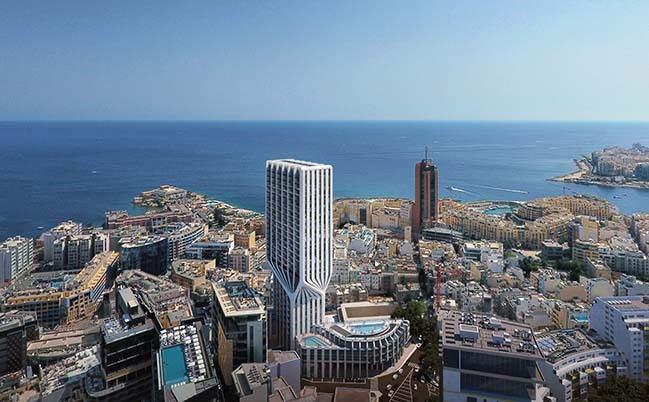 The 31-storey tower of residential apartments and hotel is aligned at street level to integrate with Paceville’s existing urban fabric and to reduce its footprint, maximizing civic space within the new piazza. Conceived as two volumes stacked vertically, the tower incorporates a realignment that expresses the different functional programmes within. The lower 9-storey volume houses apartments while the higher 19-storey volume is rotated to orientate guest rooms of the new hotel towards the Mediterranean, providing optimal views of Malta’s renowned azure sea. 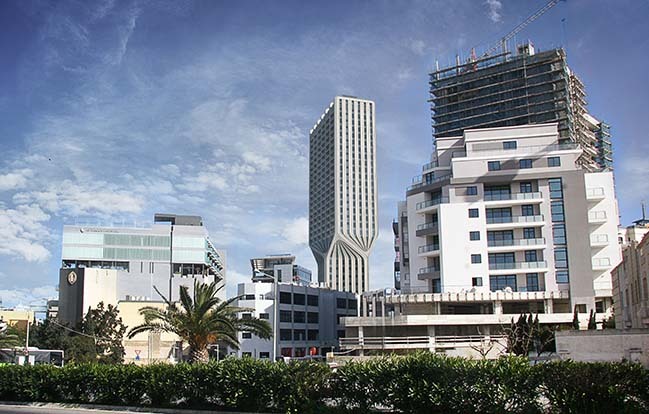 Re-aligning the tower’s higher floors reduces solar gain and instils a sense of dynamism within its silhouette that changes when viewed from different directions around Paceville. 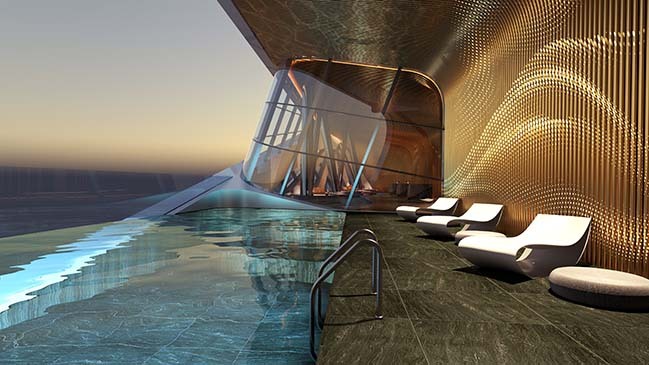 The transitioning floors (levels 10, 11 and 12) accommodate the tower’s realignment and house the dramatic public spaces of the hotel’s reception lobby as well as an outdoor pool with views to the sea. The insulated façade, combined with limited glazing in areas of significant direct sunlight, is designed to provide shading and increase the tower’s overall thermal performance. The tower’s design also incorporates the results of local pedestrian comfort and wind climate assessments. Marrying a variety of public, residential and commercial functions together with the creation of a vibrant new civic space, the redevelopment of Mercury House includes the renovation of derelict heritage structures and responds to the demands of the island’s future socio-economic development.